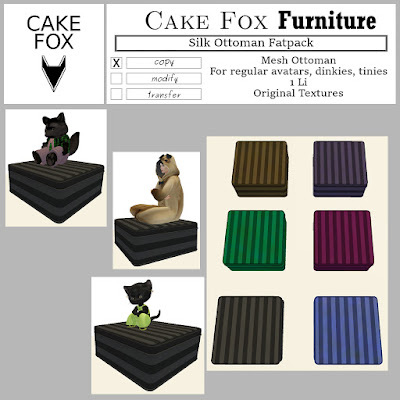 Cake Fox SWAG this weekend: Silk ottoman fatpack. Works for regular avatars, tinies and dinkies. 1 Li each. Mesh ottoman with original textures. You get all six versions in the fatpack. You can test them out before you buy. Discount only at the Cake Fox SWAG location.